Huge blooms measure 6-8 inches in diameter. 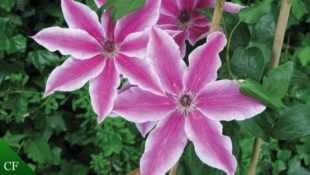 These bi-color tepals are deep violet-pink with light pink edges. The anthers are a very showy royal purple. Young vines will produce mainly single blooms and then a mix of singles and doubles as the plant matures.